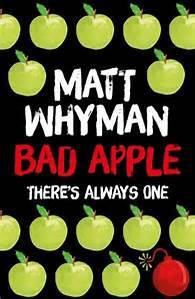 I haven’t read anything by Matt Whyman before but you may have done. He wrote The Savages and The American Savages and they have been on the my ‘to read’ list for ages. This one I had to read for the Hounslow Teen Read and the other librarians were raving about it. So, the basics. Trolls. Yes, Trolls. They live under ground and haven’t really had any contact with humans, except that they swap their babies for human babies so that they can have a better opportunity in life. Their troll-ness, doesn’t manifest itself until the child turns into a teenager and starts to show troll like tendencies. These will be things like excessive violence, a complete disregard for rules and authority, they litter, swear and vandalise stuff. In fact, it’s fairly difficult to tell them apart from normal teenager which is why they have lived amongst humans for so long undetected. But one day, someone’s house collapses down a troll hole and all hell breaks lose. DNA is taken from suspected trolls and all the ones that test positive are taken to holding facilities, like ghettos and left. There is a person in charge of the facility who is basically like a prison warder and the trolls are living in segregated communities and left to rot. Interestingly, I can think of a few kids that I have met over the years who could be trolls! It’s kind of a tongue in cheek comment about teenage society and how horrible teenagers can be (you know you can so don’t be all offended!) and the humour in it is really well written. It’s not a book I would ordinarily have picked up but I’m glad I did. If you want to read something that will make you laugh then have a go at this.